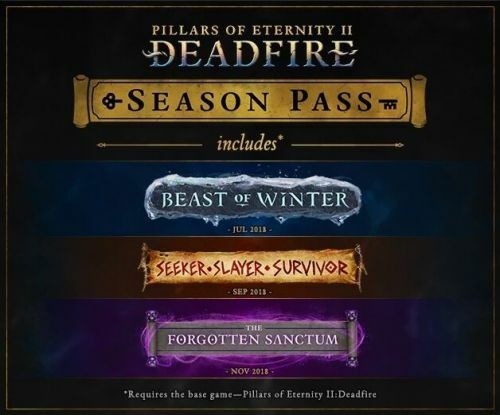 Irvine, California – April 24th, 2018 - Obsidian Entertainment, developer of critically acclaimed role-playing games, in partnership with indie publisher Versus Evil, today announced plans for three exciting, in-depth expansion packs for Pillars of Eternity II: Deadfire. The expansion packs will include new quests that will add to the lore of the Deadfire, new areas to discover, new secrets to reveal, and a whole host of new characters to meet and challenges to overcome! The first downloadable-content pack (DLC), "Beast Of Winter" will be available in July 2018, and will take your party to an island populated by a mysterious doomsday cult, that hides an ancient secret. Players will get to experience adventuring in "The Beyond," a mysterious dimension populated by ancient souls and filled with devilish challenges. The second DLC "Seeker, Slayer, Survivor" available in September 2018, is a combat-focused expansion taking place on a previously undiscovered island that will challenge the martial prowess of your party, and your tactical skills as a commander, as you embark on a mission to rediscover ancient relics, and pit your party against Eora’s most skilled and savage. The third DLC, "The Forgotten Sanctum" available in November 2018, will test your party’s allegiance and morality in a quest to help (or obstruct) the great wizards of Eora. Will you befriend, betray or befuddle these venerable mystics as you uncover secrets lost to the generations? The consequences of your actions will be felt across the Deadfire Archipelago whatever you decide. With that amount of development time, I'd estimate that these DLCs will be about half as large as the White March expansions. Let's hope that Obsidian can pack them with content that's on par with the best parts of the White March - as opposed to something that just feels small and inconsequential like the Tyranny expansion.